This March there will be an exhibition of 3-Dimensional Artworks at the Phyllis Strauss Gallery: Volume: An Exhibition of 3-Dimensional Artworks. We are hoping to showcase the best of our Ceramics and Sculpture Departments, and we encourage you to submit work! 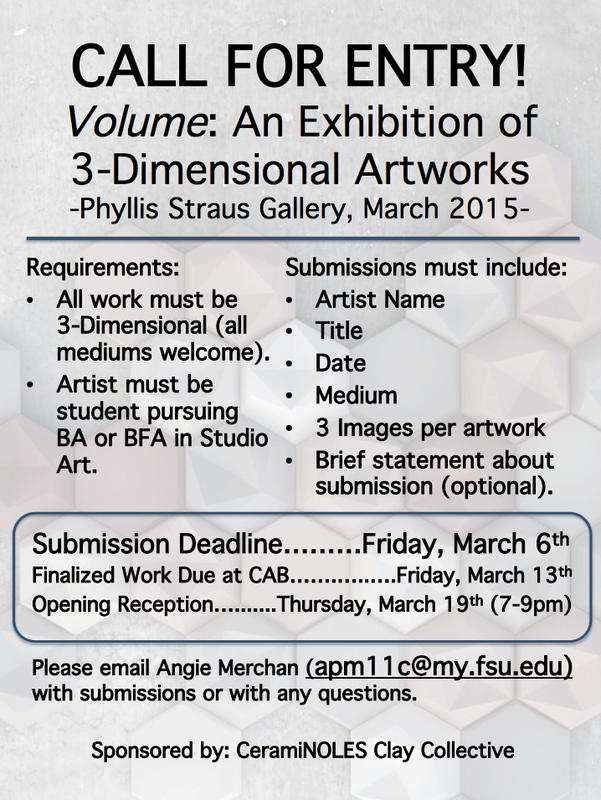 All work must be 3-Dimensional (all mediums welcome). Artist must be a student pursuing BA or BFA in Studio Art. Submission Deadline: Friday, March 6th. Finalized work due at CAB: Friday, March 13th. 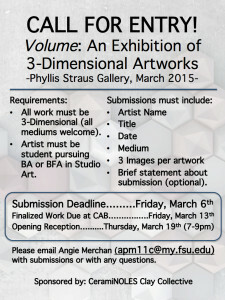 Please email Angie Merchan (apm11c@my.fsu.edu) with submissions or with any questions.